Peru's President Martin Vizcarra holds up a folder as he waves next to next to Prime Minister Cesar Villanueva, left, as they leave the government palace for Congress where he plans to urge legislators to declare an emergency at the attorney general's office, Jan. 2, 2018. Peru's attorney general on Wednesday reversed his dismissal of the lead investigators in a sweeping corruption probe into top officials, retreating in the face of a growing public outcry and a bid by the president that could remove him from office. “It is good that a decision under such scrutiny has been rectified,'' Vizcarra said after leaving Congress, but he added that he would press forward with his drive to root out corruption in the Public Prosecutor's Office. 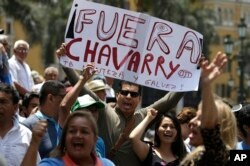 A demonstrator holds up a poster that reads in Spanish: "Get out Chavarry! ", referring to Attorney General Pedro Chavarry, in Lima, Peru, Jan. 2, 2019.